French painter of Polish origin, influenced by Charles Le Brun; his subjects include biblical and mythological themes; born Paris (1649), died Paris (1715). Cartoon for a tapestry, Alexandre Ubeleski (1649-1715). Paris: Musée de Louvre, Inv. 6666; actually owned by the Museum, Arras (Pas-de-Calais). Ref. Mirimonde (1977: 85, fig. 1). A nymph dances and a satyr pipes. Includes a trophy with a musette, duct flute and syrinx. An example of the tapestry itself is at the Palais Rohan, Strasbourg. Dance of a Nymph (1670s), painting, Alexandre Ubeleski (1649-1715). Arras: Musée des Beaux-arts. Ref. Wikimedia Commons (2014-col.) Before an enormous urn standing on a plinth with an inscription, a nymph in flowing robes holds a wreath as she dances to music played on double-pipes by a satyr. Three aerial putti hover above, one playing a tambourine. In the foreground is a sort of trophy comprising two horns, a violin, musette, syrinx, tambourine and flowers. The chanter of the musette looks somewhat like a recorder with its ivory mounts. Contemporary USAmerican painter and magazine illustrator whose works adorn The New Yorker, New York Times Magazine, The Atlantic Monthly, Time, and Newsweek Japan; born late 1950s. WWW Page. American Recorder 38 (3): cover (1997), Mark Ulriksen (ca 1995–). A man in sandals, jeans, a waistcoat, glasses and beret with a six o’clock shadow standing on an island in view of the Golden Gate Bridge plays a stylised baroque recorder. Italian painter and frescoist; born Venice (1711), died Padua (1798). Frieze with Musical Instruments, early 18th century, fresco, Andrea Urbani (1711-1798). Vicenza: Castello di Montegalda, Villa Grimani Sorlini. Ref. Angelo Zaniol (pers. comm., 2003). 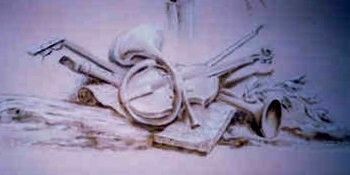 A trophy with music books, violin and bow, horn, ?shawm, ?lute, and a baroque-style recorder. The distinctive head and beak are clearly depicted. Flemish artist, essentially a still-life painter of fruit and game, although he sometimes set these in a kitchen interior or on a breakfast table to form a genre piece; he also painted monumentalised animal pictures, hunting trophies, and farmyard scenes, typically including poultry – turkeys, parrots and peacocks; the figures in his paintings were often the work of others (Jordaens, Teniers, Thulden, Rombouts); born Antwerp (1599), died Antwerp (1653). Still-life (1644), oil on canvas, 185.0 × 242.5 cm, Adriaen van Utrecht (1599-1653). Amsterdam: Rijksmuseum, SK-C-301. Ref. Paris RIdIM (1999). The subject of this huge canvas is abundance and opulence. On a table and spilling onto the floor lies a jumble of fruit, a lobster, a ham, etc. Against a chair lean a guitar and a pipe (probably a flute), the lower part of which is visible showing a thicker foot and four finger hole. A lute and violin lie on the floor with an open book of music, books, fruit, nuts, and a baboon which is helping itself to the fruit. What appears at first sight to be the foot with the fontanelle of a recorder can be seen jutting out from under a cloth thrown over the chair; on closer inspection, however, this is clearly the characteristic pirouette of a shawm. A small poodle and a parrot survey the scene, which is not strictly a still-life at all since it contains living creatures. Dutch painter and draughtsman whose works include classical and genre scenes which reflect the transition from Mannerism to a more naturalistic style in Dutch art; born Utrecht 1566, died Utrecht 1638; father of Peter Uytewael (1596-1660). Mercury and Argus, pen, ink and grey wash on paper, 19.9 × 32.0 cm, Joachim Uytewael (ca 1566-1638). Detail. Private Collection; auctioned Phillips. Ref. Bridgeman Art Library (2002: Image ID PFA 166765 – col.) One half of this drawing shows Mercury, naked except for his winged helmet, sitting on a rock playing a long, slender pipe. Mercury’s caduceus and sword are hidden behind him. In the other half of the drawing, Argus sleeps against a tree. Banquet of the Gods (1605), painting, Joachim Uytewael (ca 1566-1638). Location unknown. Ref. Website: klassiskgitar.net (2007 – col.) The gods enjoy themselves as only they know how. Everyone is there. Seated on a cloud above the banqueting table, Apollo plays his fiddle. Perched on another cloud which seems to have be caught in the boughs of a tree, Fame blows a sigmoid trumpet held in her left hand; she holds a shorter, straight trumpet in her right. Beneath her, at the foot of the tree, the Muses play clavichord, lute, viol and a slender cylindrical pipe (possibly a recorder) played by Euterpe. Reclining on a rainbow in the top centre background, Eris, goddess of Strife, seems to be preparing to drop her golden apple, setting off the train of events that will lead to the Trojan war. Mercury and Argus, black chalk on paper, 19.7 × 33.3 cm, Joachim Uytewael (1566-1638). Göttingen: Kunstsammlung der Universität, Inv. Sammlung Uffenbach H 85. Ref. Rijksbureau voor Kunsthistoriche Docmentatie 54303 (2010-b&w). Argus dozes as Mercury plays his pipe. Io (as a heifer) grazes in the background; the other beasts look on. Dutch painter of genre, marine and religious works; born 1596, died 1660; son of Joachim Anthonisz. Uytewael (1566-1638). A Jester Holding a Flute (1623), oil on panel, 56.8 × 36.3 cm, Peter Uytewael (1596-1660). Amsterdam: Sotheby’s, Old master paintings, 1 December 2009. Ref. Paris RIdIM (1999); Gabrius Data Bank, OMP (2000 – col.); Bridgeman Art Library (2003: Image NOR86709 – col.); Website: Lawrence Steigrad Fine Arts (2007); Rijksbureau voor Kunsthistorische Documentatie, illustration 11577 (2014-col.) A young man with a smile holds a cylindrical duct flute (flageolet or recorder). The first two fingers of the player’s lower (right) hand cover their holes leaving two open for the other fingers on this hand; thus it would appear to be a recorder. This appears to have been restored recently. Possibly a self-portrait of the artist. Dutch painter and etcher, amongst the best paid painters of his time; his subjects include Arcadian landscapes with biblical or mythological figures, the latter from the Metamorphoses of Ovid, published by Karel van Mander in 1604; born The Hague (ca 1600), died The Hague (1647). The Judgement of Midas, Moyses van Uyttenbroek (ca 1600-1647). Dordrecht: Museum. Ref. Anthony Rowland-Jones (pers. comm., 2001). Pan plays a slender, slightly flared alto sized pipe (possibly a duct flute), left hand lowermost, all fingers down. The Triumph of Bacchus, oil on oak panel, 54.8 × 97.0 cm, Moyses van Uyttenbroek (ca 1600-1647). Kassel: Gemäldegalerie Alte Meister, GK 189. Ref. Munich RIdIM (2009, Kksg – 72). Bacchus is drawn in a chariot in a long train of cherubs, satyrs and Bacchae. Before the car are a dancing satyr dancing, a putto banging a drum, and two bacchantes playing recorder and flute. Group of Children Enacting the Triumph of Silenus, grey wash over brown ink and red chalk on paper, 14.9 × 25.4 cm, Moyses van Uyttenbroek (ca 1600 – 1647). London: Christie’s, Sale 9768, Old Master Pictures and Drawings, 12 December 2003, Lot 517. Ref. Rijksbureau voor Kunsthistoriche Documentatie 108654 (2010-col). The infant Silenus is carried by of his companions to music provided by a fifth who plays a pipe with a flared bell, probably a recorder. An oil on panel by Uyttenbroek depicting A Peasant Bacchanal in the National Museum, Warsaw (Inv. 128572), shows a group of putti in the lower right corner with some similarities to that drawn here. Mercury Lulls Argus Asleep (1618-1628), print (etching & engraving), 13.1 × 18.5 cm, Moyses van Uyttenbroek (ca 1600 – 1647). Amsterdam: Rijksmuseum, Inv. RP-P-1880-A-4196. Sitting beneath a tree on a lightly forested hillside, Argus dozes. Mercury, his recorder in one hand gestures with the other hand to a stream at their feet. Io (as a heifer) stands behind them, and sheep and goats graze on the slope in front of them.